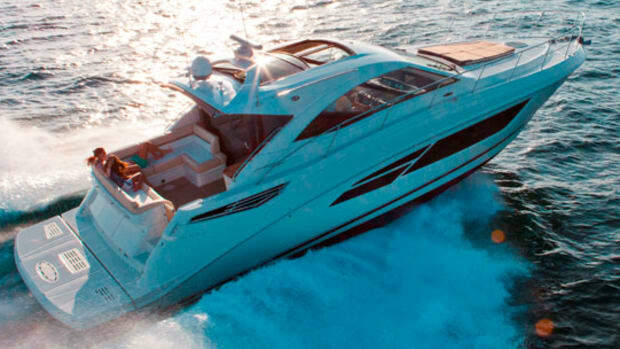 With the new 400 Fly, Sea Ray continues to recreate the sport yachts that made it so successful. 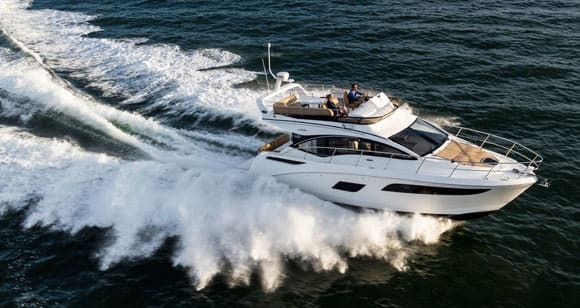 I haven’t been able to verify this but nevertheless I’m going to go out on a limb and say that Sea Ray has built more inboard cruisers in the 40- to 50-foot range than anyone. If you doubt me, just walk down the docks at your local marina and count how many Sundancers and Sport Yachts you see. 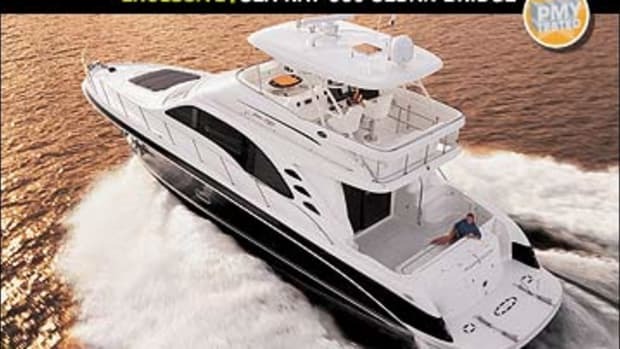 One big reason Sea Ray so dominated that market was its ability to squeeze an inordinate amount of living space out of a given envelope; another was attractive pricing. 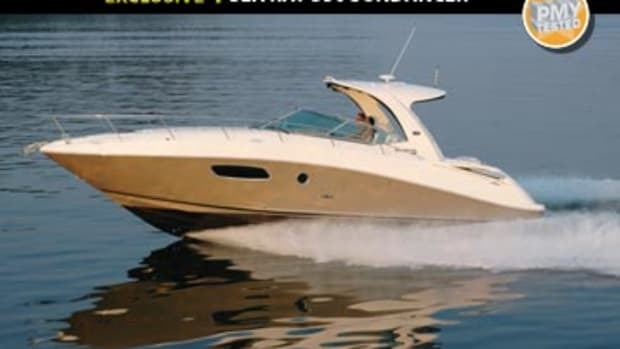 For years this combination was so effective that Sea Ray didn’t need to recreate models every few years, just refresh them. The Great Recession rendered the boating marketplace a much more competitive arena and made that evolutionary strategy moot. 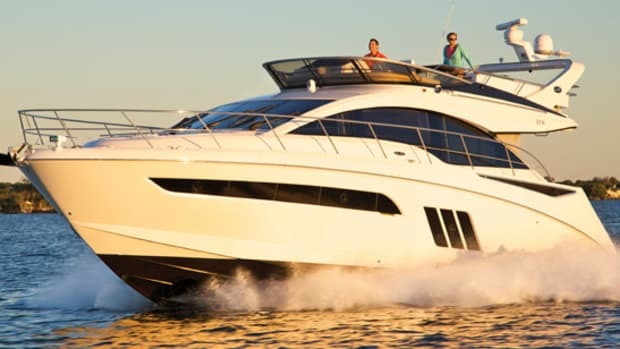 Recognizing this, four years ago Sea Ray committed to not only redesigning but rethinking its Sundancer/Sport Yacht lines. Working from the keel up, the aim was to create innovative designs that once again maximized space and value. The result was first the 510, then the 450, and now the 400, which is available as the Fly that I tested and an express, the Sundancer. The 400 is a big 40-footer; it’s 40 feet LOA without the swim platform, which you can have in standard fixed or movable hydraulic versions. Even so the size is deceptive—from the docks the 400 looks larger than her LOA. Indeed, the older 47 that was moored in the next slip actually appeared smaller. And that impression is not illusory, as you realize the moment you step aboard. At first glance the 400 is yet another interpretation of that popular genre, the coupe. That means the saloon and cockpit are on one level, the bulkhead between them is basically solid glass and opens wide enough to make the two areas feel like one, and pretty much everything on either side of the saloon is glass. 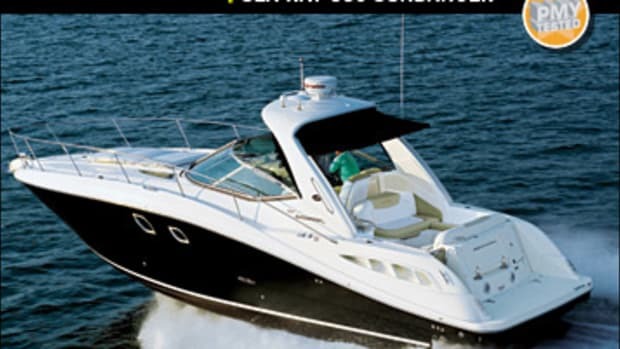 But Sea Ray has put its own spin on the concept, and one difference is the galley. The most popular strategy these days is to place it aft by the saloon door where it can serve the cockpit easily. But the 400’s galley is well forward and to port, although that doesn’t necessarily translate into more footwork for the chef. More to the point, if you order the Transom Gourmet Center, you’ll enjoy an electric grill and sink on the after side of the transom. This not only puts the grillmeister in close proximity to cockpit occupants, it also virtually eliminates having to mop the galley sole after dinner is served since the “galley sole” is the swim platform. The platform itself is indicative of the thought that has gone into the 400. If you order the hydraulic version you get a nifty stairway to port that automatically extends as the platform drops, making it ridiculously easy to access it from the cockpit and vice versa. Both it and the standard fixed platform are resin-infused, which not only saves weight but also increases carry capacity by roughly 100 pounds. That’s important because the 400 is a V-drive boat, which means the mass of its twin Cummins QSB6.7s, the only power offered, is well aft, which shifts the center of balance. More weight on the swim platform, which on the hydraulic version will probably carry a tender or jet ski, could result in a bow-high running angle, particularly during planing. 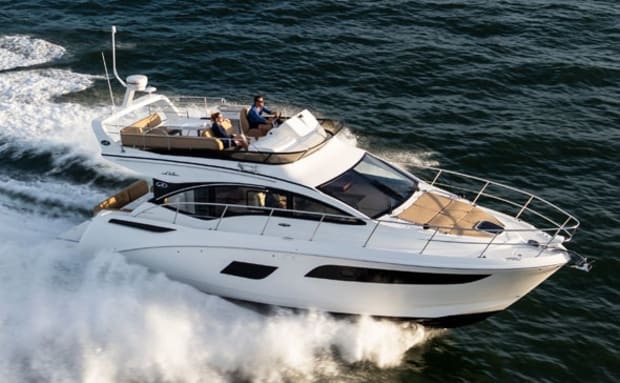 No such characteristic revealed itself during testing, but just in case you find yourself in less than ideal running trim with the 400 you’ll have access to Sea Ray’s Dynamic Running Surface (DRS). Imagine large movable triangles placed flat against the hull bottom in either aft corner, attached with with a hinge along the inboard hypotenuse. When deployed a ram above in a pocket pushes the whole thing downward, actually flattening the transom deadrise and generating considerably more lift than would conventional trim tabs. Manual control is standard but the hot setup is the automatic version that corrects trim anomalies without your intervention. 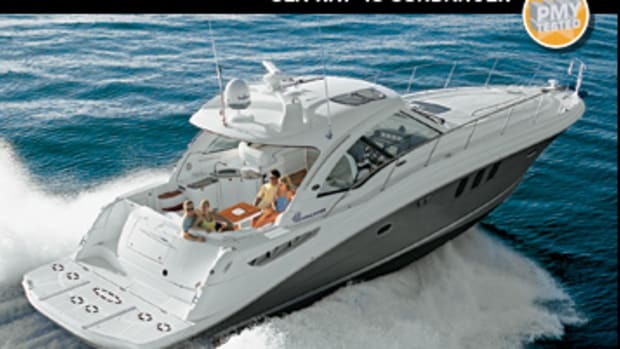 Of course, V-drives free up interior space, but the manner in which Sea Ray has allocated it is interesting. There are two staterooms, the after of which has two athwartship bunks that can slide together to create a big single. There’s also a single berth along the starboard side, which means this configuration works for either families or a couple wishing to bring along a pair of guests. Adding to the flexibility is the option of a second head to port; if you don’t order it you’ll get a large stowage area. 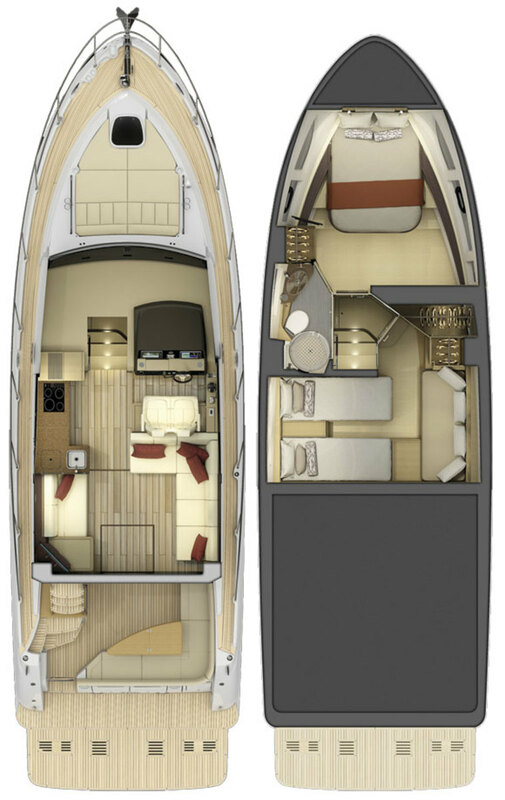 This leaves the V-berth as the master, and with en suite facilities (including an enclosed shower) and port and starboard lockers, the space lives up to its billing. Large port and starboard windows brighten things, but unlike most, they’re low enough so that when you enter you’re looking at water instead of sky—or worse, the boats next door. The fact that the V-drive Cummins are “backwards” presents potential access and service issues, which are obviated by a cockpit sole that lifts electrically, providing excellent access to everything save the Racors, which are consigned to the aft port corner. You can get to them and you can see the settling bowls but you may have to lie on the engines and use a flashlight to do so. There’s also a 3-foot-by-3-foot saloon hatch by which you can access the forward part of the engine space. However, given that the walkway between the motors is obstructed by seacocks and strainers (to the point that it’s quite a struggle to reach even the dipsticks) and given that you can have virtually total access by simply pushing a button to raise the cockpit sole, I don’t see this mode of access getting much use. Running the 400 is effortless; she’s predictable and well mannered, to the point that I never had to employ the DRS. A reasonable throttle setting of 3000 RPM produces better than 27 knots and decent range from the single 352-gallon fuel tank; it’s forward of the engines to minimize running-angle variation as fuel burns off. The 400 is also quiet, thanks largely to a proprietary underwater exhaust system that I was delighted to discover doesn’t burble as the boat comes on plane. Low-speed maneuverability was noteworthy, thanks in large part to the fact that my 400 was fitted with the Cummins Inboard Joystick system. 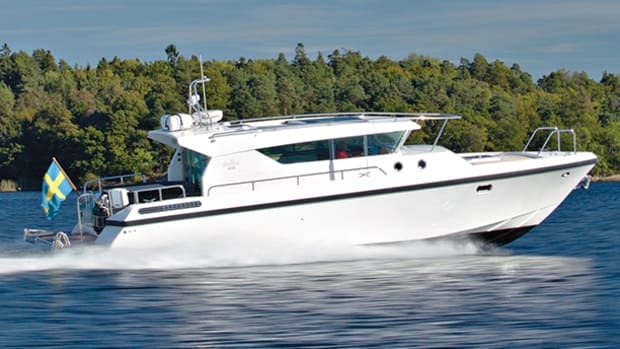 Developed jointly by Sea Ray, Vetus, and Glendinning, it employs an oversize 125-killowatt electric thruster that is powered by its own battery bank and charging system. The joystick lets you activate the thruster alone in one mode, or the thruster along with the engines in another. Either way, when the thruster kicks in you can really feel it, and the oversized motor should reduce the likelihood of a popped thermal breaker if you lean on the system a bit too long. 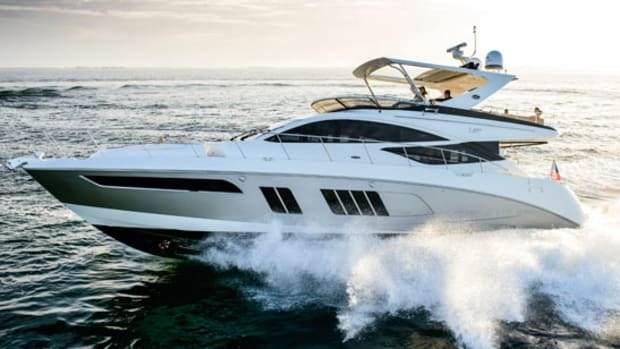 Good performance is yet another reason for Sea Ray’s perennial dominance in the 40- to 50-foot cruiser category, and given the comprehensive overhaul of its models in this range it’s a safe bet that such dominance will continue. 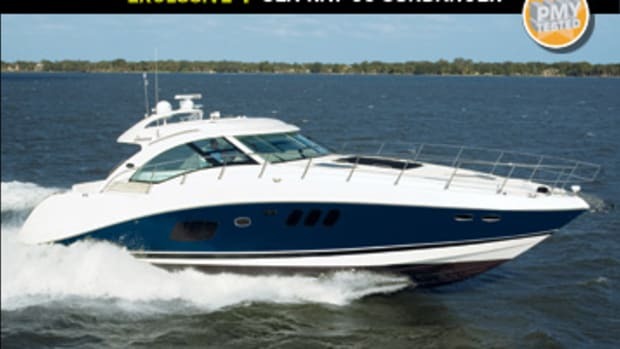 Click to see listings of Sea Ray Yachts currently for sale on BoatQuest.com. 300 gal. fuel, 100 gal. water, 3 persons, 100 lb. gear.